The 3 1/2 x 3 1/2 ViewCatcher is constructed of durable plastic to hold up to the elements and provide years of use. It is colored a #5 gray to help judge value and has a small sight opening in the center that enables artists to see "true" color. It can be held at different distances and the adjustable opening can be oriented horizontally or vertically to help find just the right composition. • Use it to find placement of your still-life objects and focal points. • Plein-aire artists now have a weapon in the battle for the perfect landscape. 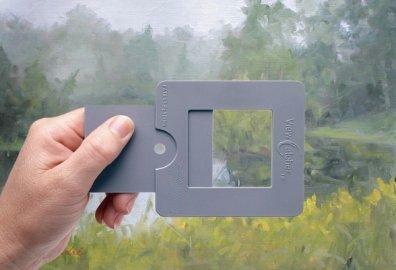 • View your subject matter or painting without surrounding elements.